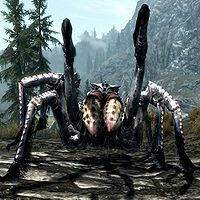 Frostbite Spiders are giant arachnids which attack on sight, and can be found both in the wilderness and in dungeons. Their lairs are often covered in webs, and usually contain web sacs. Spider Eggs can be found in these web sacs, as well as nearby egg sacs. When at range they spit poisonous venom (spell Frostbite Poison, Health + Stamina Damage, 5 pts for 5 seconds), and can leap onto victims to attack with their bite. Without poison resistance, you will be poisoned by nearly every hit from these monsters. Their victims, dessicated corpses, can sometimes be found nearby. This page was last modified on 15 December 2018, at 03:16.